Uber is in the midst of several lawsuits and has a controversial CEO leading the company. It also has to placate its own growing horde of dissatisfied drivers who complain that their revenue potential is dropping, even while Uber exaggerates how much its drivers earn. Bloomberg reports that Uber may have yet another problem on its hands with its new "upfront pricing" fees. The feature, introduced last year, allows Uber to charge some passengers more for their rides. The problem is that Uber hasn't changed the way it pays its drivers; they're still generating money the same basic way, based on time, distance and mileage. Accusations that upfront pricing benefits Uber rather than drivers are nothing new. Blogger Christian Perea at The Rideshare Guy complained that Uber was secretly overcharging passengers and not paying drivers, and there was a lawsuit filed alleging the same thing this past April. According to Bloomberg, Uber's head of product Daniel Graf has said that upfront pricing uses machine-learning to figure out how much riders are willing to pay for a given ride and then charges them accordingly, a feature he called "route based pricing." Bloomberg interpreted this to mean that riders traveling routes in wealthier areas would be charged more than those in less high-end areas. However, an Uber spokesperson who spoke to Engadget on the phone said that Uber only uses rider demand to inform its upfront pricing structure, not rider apparent wealth. He confirmed that the fare charged to customers in high-demand areas can be higher than the driver's take, which is typically based on time, distance and traffic. This type of pricing is only in areas that have Uber's carpooling service, as well. "We price routes differently based on our understanding of riders' choices so we can serve more people in more places at fares they can afford," he said. "Riders will always know the cost of a trip before requesting a ride, and drivers will earn consistently for the work they perform with full transparency into what a rider pays and what Uber makes on every trip." In other words, some folks will pay a bit more to get a dedicated UberX car in high-demand areas and others might be willing to wait a bit more for a more affordable UberPool ride. Uber then uses aggregate data from past users' behavior to set upfront pricing accordingly. 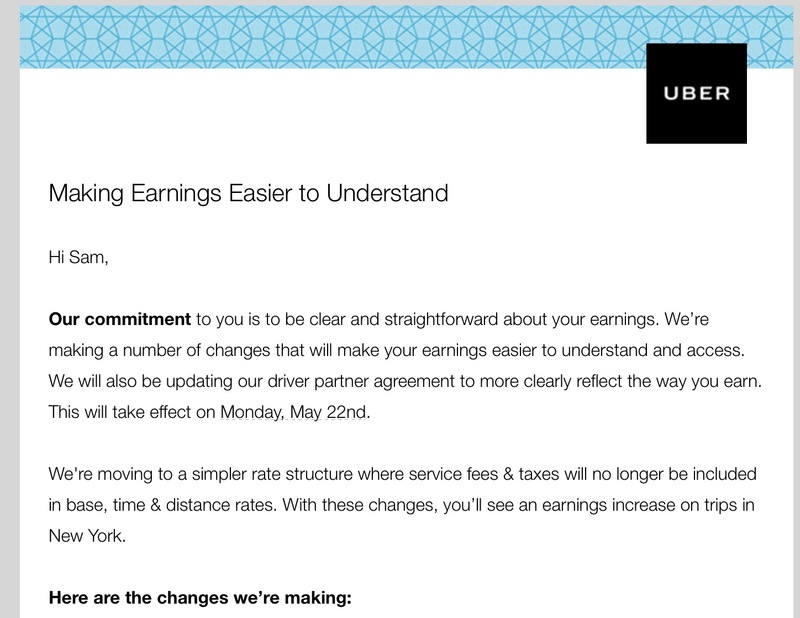 Uber sent the above email to drivers today to communicate this change. Uber's spokesperson also told us that any extra funds from this kind of differential pricing are going right back into promotions that show drivers where they can make more per ride as well as into funding more Uber drivers on the road to help cover high demand. The perception of Uber as a company trying to scam its drivers out of extra ride fares is a dangerous one, whether it has a kernel of truth or not. Some might also see it as muddying the waters of Uber's claim that it's just a middle-man. Drivers might understandably be upset if they see themselves as independent contractors using an app to facilitate ride-sharing -- a claim Uber itself encourages -- who are not seeing any benefit from higher per-ride fees. Bringing in more money from riders may help Uber itself, but it could also alienate drivers, who may not understand or believe Uber's explanations. Transparency about how pricing actually works could go a long way to help Uber's perception problem.